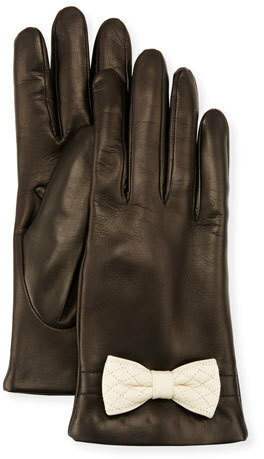 Parade your outfit coordination chops by teaming a black coat and black leather gloves for a casual outfit. If you don't know how to finish, a pair of hot pink suede low top sneakers is a winning option. Consider wearing a red leopard coat and Portolano black leather gloves for a stylish and edgy outfit. Finish off with black leather ankle boots to spice things up. A black blazer and Portolano Leather Bow Cuff Gloves Blackwhite paired together are such a dreamy outfit for those dressers who love cool chic outfits. For extra fashion points, complement your look with a pair of black leather pumps. If you're all about being comfortable when it comes to fashion, this combination of an olive pea coat and Portolano black leather gloves is totally for you. If you gravitate towards laid-back combinations, why not try this combo of a navy coat and black leather gloves? Black leather chelsea boots will pull this full outfit together. 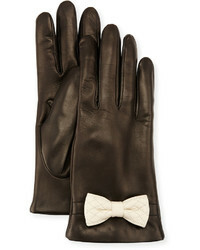 Why not marry an orange wool biker jacket with Portolano Leather Bow Cuff Gloves Blackwhite from Neiman Marcus? As well as totally practical, these items look wonderful paired together. Pairing a black parka and Portolano Leather Bow Cuff Gloves Blackwhite from Neiman Marcus will allow you to display your sartorial prowess even on weekend days. For something more on the smart end to finish off your outfit, complement your getup with a pair of tan suede wedge sneakers. Consider pairing a dark green coat with black leather gloves, if you prefer to dress for comfort but also want to look stylish. Puzzled as to how to finish off? Add a pair of black suede over the knee boots to the equation to turn up the chic factor. If you're all about comfort dressing when it comes to your personal style, you'll love this adorable combination of a charcoal coat and Portolano Leather Bow Cuff Gloves Blackwhite from Neiman Marcus. Put a dressier spin on your look by finishing with a pair of black leather over the knee boots.